Best tool for the most fast, secure reliable communication with company staff and clients - Bulk Text (SMS) messaging - an ideal instant online broadcasting technology. Our company was established in 2001 as vendor of email software, ecommerce and marketing.Over the years we became one of major players on both American and European markets and extended the range of products.Currently the company is made of over 30 professionals who create new software products, update existing software and provide customer care to our customers. We have offices in the United States, Russia, Australia, Ukraine, Spain and Latvia. SMS sending starts at a specified date and time. This is very useful if the recipient is located in a different time zone. Also, you can use the scheduler to send a reminder of a particular event, or pre-compose and send greetings. When you send free bulk SMS online, each message can contain a link to unsubscribe from the mailing, forwarding the recipient to unsubscribe page with his phone number, which will be added to the “Exceptions” list. Statistics provide a thorough report on the delivery of SMS messages, with details of the status of delivery, time, cost, and number of parts. You can send bulk sms online and monitor their efficiency on a real-time basis. Send mass text messages all over the world with more than 200 countries and 900 operators. SMS sending is carried out at a speed of 200-500 SMS/sec. A recipient gets the message just seconds after delivery starts. Send SMS in any language thanks to Unicode support. Send both individual and bulk SMS messages. Support for long messages. SMS larger than 160 characters GSM or 70 Unicode characters are split into pieces (delivery of the SMS messages longer than 6 parts can be difficult). Sending scheduler. Start your mass texting campaign on the specified day and time. Sending online text messages in parts over a specified interval of time. The ability to allocate time to mass distribution over a large number of subscribers. Dynamic alphanumeric sender’s name. While sending messages, you can specify any number or letter name as the sender (SMS “substitute service”). Personal account that you can access from anywhere in the world. Integration of bulk text messaging into your own web projects using basic and advanced API interface with connection to the SMS gateway. Ready modules for integration with CRM, CMS, e-commerce systems and SaaS-platforms, including a specially designed module Atomic SMS Sender for 1C: Enterprise. Support of SMPP, HTTP / HTTPS, Email2SMS protocols. Template creation for different types of sending. Reporting on each SMS campaign: total distribution, number of delivered and undelivered messages and those waiting to be delivered. Ability to maintain “clean” lists by adding contacts to the “Exceptions” list. Easy subscription forms creation with unique design and style. Two-level subscription system: confirmation code sending. SMS messages may contain a link to unsubscribe from the ads. Phone numbers of those who have unsubscribed are put into the “Exceptions” list. 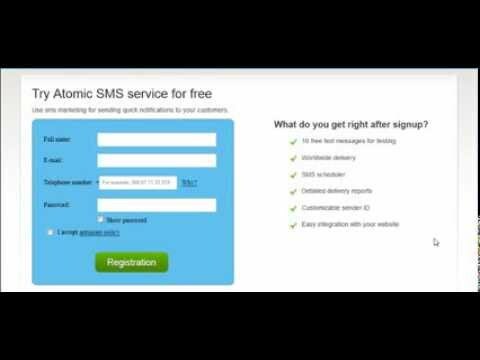 Safety of data sent via Atomic SMS Sender. Non-proliferation of any information about customers and partners without their consent. Atomic SMS for Google Chrome Extension is available for free. Fast sending SMS from Google Chrome extension without the switching to member area. Extracting phone numbers from all the webpages you have visited. Automatic country detection by domain or webpage language. Creating reports about sending campaigns in SMS service account. Mass text application was created for both iPhone and Android platforms. The possibility to create your own newsletter on the mobile device. Sending the single or mass SMS to people in your mobile phone book or online contact list. Creating your own subscriber’s lists. The possibility to include the unsubscribed recipients to “do not sms” list and never sent text messages to them. Receiving detailed reports about delivery status and campaign in general.